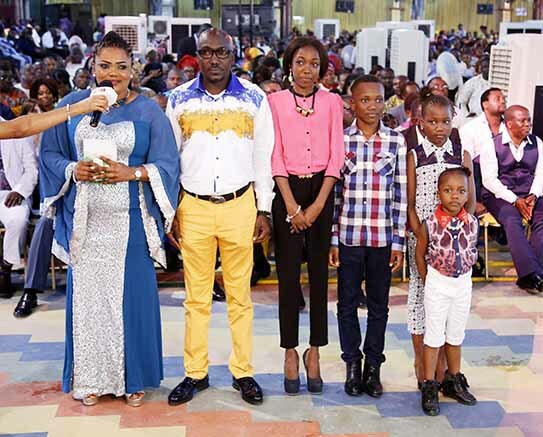 The glory from above radiated unhindered in the auditorium as the choir did what they know how to do best – keeping the congregation on their feet as they doled out tunes of praise and worship. The message in their songs prepared the ground for sober reflection, repentance and forgiveness. 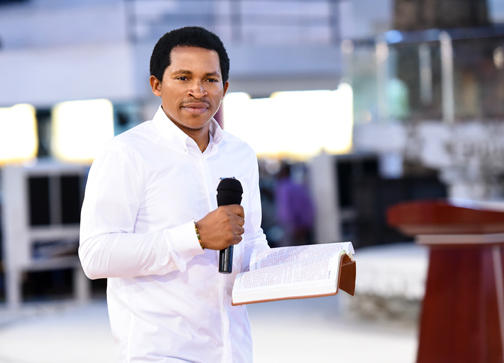 It created the platform for Evangelist Daniel’s message to sink deep into the hearts of the children of God. Citing relevant scriptures, he observed that loving and praying for those who hurt us releases us from destructive emotions that make us look ugly in the face of God: “When you love your enemies and pray for those who hate you, this releases you from the destructive emotions of anger, bitterness, revenge and others.” He concluded by urging Christians to emulate Christ who prayed for those who crucified Him, stressing that being unwilling to forgive shows that we have not understood or benefitted from God’s forgiveness. Raised in a family that was not very godly, Mrs Douglas grew up to discover that there was an inherent power that controlled her life. Perhaps, her father’s involvement with traditional practices had taken a negative toll on her spiritual life. Though her mother tried to serve God, the devotion was not as solid as expected. Mrs Douglas’s reputation for trouble-shooting in her younger days was a well-known characteristic. She would talk down to people and was always ready to stir the hornet’s nest. She had no regards for elders and felt as though the world was on her finger tips. The fact that her father owned the building where they lived also contributed to her problem. As far as she was concerned, being a landlord’s daughter was enough licence to look down on the tenants. That power that controlled her life soon manifested itself while she was on a visit to see her elder sister. It was in a dream encounter – a spirit husband slept with her. When she woke up from sleep, she discovered that her undies had been pulled down to her utter surprise. After conferring with her equally discomfited sister over the embarrassing development. The more she tried to come to terms with that strange reality, the greater her confusion and anger. Gradually, the spirit of anger pitched its tent in her soul and made her a bunch of trouble to the extent that family members became very wary of her mood and temperament. She would shout at anybody, irrespective of age or status. She was just fearless. Mrs Douglas was alienated from serious family matters because of her temperament. She was virtually kept incommunicado. Her elder sister took her to different places in search of solution but it appeared that all her efforts were a waste of time and energy. The anger, rudeness and domineering spirit became worse. As a married woman, her husband felt the brunt of her overbearing attitudes. She did not obey his instructions. Instead, she would order him about and make him feel like the wife of the house. On a particular occasion, she manhandled him and tore his clothes from head to toe, leaving him almost stark naked just because she felt he was not giving her support. She also dropped out of university on two occasions owing to her anger and lack of patience. Mrs Douglas was somewhat irredeemably cantankerous. Even in her children’s school, she would quarrel and fight with other parents on the slightest provocation. While driving, she never spared other drivers who might have offended her. She would wind down her glass and unleash verbal terror on them. The spirit husband ensured that her senses of shame and decorum were no longer existent and so it tossed her around at will. While her late father’s burial arrangements were in top gear, she had injured her elder sister with a broken bottle because she insisted that her own plan and list should supersede all others. Her children avoided her as she was always harsh to them. They preferred the company of their father who was more accommodating. One day, after falling out with salon attendants who abandoned her hair to pray along with Prophet T.B. Joshua on the Emmanuel TV in their shop, Mrs Douglas returned home only to encounter another Emmanuel TV saga. Her husband instructed her to watch Emmanuel TV and pray along with the man of God. Though she obeyed that instruction while he was at home, whenever he went out of the house, she would change the channel. But Mrs Douglas discovered something whenever she watched Emmanuel TV. She realised that she always had inner peace and was submissive to her husband. On his part, Mr Douglas encouraged his wife to visit The SCOAN and was elated when she agreed to come with him to the Arena of Liberty. Mrs Douglas was captured by the Holy Spirit on the penultimate Sunday, as Evangelists ministered the Morning Water. The spirit husband spoke through her and confessed all the wicked acts it had perpetrated in her life. After her deliverance, the love and peace that had deserted her family returned. Testifying in company of her husband and children, she told congregants that her life has taken a better turn. She regretted all those things she did under the demonic influence of the spirit husband. According to her, the love and peace she now enjoys are indescribable. “The spirit of anger is real but don’t run away from God,” she advised people all over the world. Mr Chimaroke Nnaji is an engineer by profession. His interest was caught by Prophet T.B. Joshua’s prophecy concerning agriculture. The man of God had prophesied that oil would lose its value globally and that agriculture could well be a way out for the world. Having considered the prophecy, Mrs Nnaji’s wife urged him to key into it. Even though he was initially reluctant, a friend’s mention of that prophecy during another visit to The SCOAN, convinced Mr Nnaji that it was truly from God. And without wasting time, he started a fish farm in his house. Within three months, he had started making huge harvests. As time went on, Mr and Mrs Nnaji registered and incorporated their farm and started selling and processing their products with a trademark. As the business grew, they acquired plots of land in their home town where they built bigger fish ponds and embarked on other forms of agriculture such as food crop farming. They also started a palm plantation. As it stands today, they have so many customers who are queueing to start exporting their products. According to Mr Nnaji, there have been talks with many agencies regarding the processing and exportation of their products. Mr Nivard Malcolm started having strange feelings after he drank a potion given to him by a voodoo priest who had promised to cleanse him of all impurities. Since that day, he had not been himself. He knew something was wrong with him as he felt a strange presence in his body. All efforts to disentangle himself proved abortive. The man from the Virgin Islands started having nightmares in which he would see serpents, especially pythons. Gradually, his finances collapsed. He was unable to get married and was later haunted by insomnia. In the face of those challenges, a friend told him about Prophet T.B. Joshua. Mr Malcolm searched for the man of God on the internet and was convinced that God was here in The SCOAN. Though it took him a while to save enough money for the visit, he eventually landed in Nigeria from the USA where he resides. When Mass Prayer was going on during the penultimate Sunday service, Mr Malcolm was arrested by the anointing as the python in him manifested. “I control him, he is mine – his body belongs to me… this guy is supposed to be a great musician… No marriage – no woman… the master was the one who put me inside here,” said the frustrated spirit. After undergoing the anointed operation of the Holy Ghost, the python spirit was cast out. During his testimony last Sunday, Mr Malcolm, exuded great joy as he now enjoys freedom and peace of mind. According to him, he now has clarity of mind and can sleep without any hassles. He advised people all over the world to desist from self-acclaimed priests and healers who only end up messing people’s lives. He urged those seeking solution to any problem to seek the face of God in any living church where they can get their deliverance. Mr and Mrs Akpobor Udu were married but could not enjoy the peace that is supposed to be part of a Christian marriage. 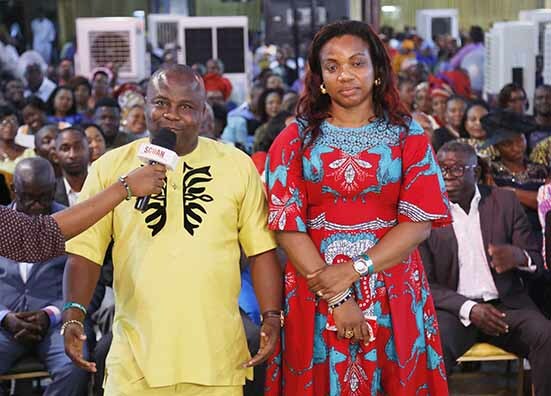 Aside from the challenge of barrenness that had left them childless, Mr Udu was constantly being harassed by a spirit husband who was after his wife. On several occasions, the spirit would engage him in fierce battles in his dreams. Unyielding to all of Mr Udu’s resistance, the spirit husband gave him something to remember. He was afflicted with priapism – a permanent erection that defied all attempts to bring it down. For days, the Delta State of Nigeria indigene was in severe pains as his veins became overstretched. When it dawned on him that the situation was beyond him, he visited The SCOAN where the man of God prayed for him at the Prayer Line and he was delivered. After his deliverance, the recalcitrant erection bowed to the power of the Holy Spirit. Mr Udu also received the Morning Water. Having been delivered from the affliction of the spirit husband, the next challenge was to ask for the fruit of the womb. Mr Udu prayed and ministered the Morning Water together with his wife. 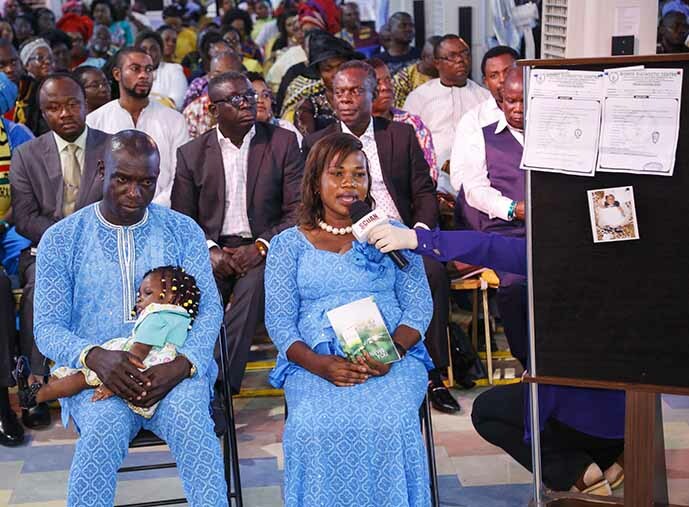 The couple met as husband and wife and to the glory of God, Mrs Udu became pregnant. Her pregnancy progressed smoothly until the seventh month when it was discovered that the foetus was in a breech presentation. Confronted with that unpleasant reality, Mrs Udu confessed that the child in her womb was a child of God and would not be troubled under any circumstance. She ministered the Morning Water and prayed. After a few days, the foetus returned to the normal position. When it was time to deliver her baby, the devil tried to strike. On her mother’s advice, Mr Udu was taken to a traditional medicine practitioner who claimed that a rope was holding the baby back and that delivery would be difficult. But unmoved by such a spurious claim, Mrs Udu further reiterated her faith in God by confessing that as a product of prayer, her baby would come forth through normal delivery and nothing less. As she made that confession, she also ministered the Morning Water. In a matter of minutes, labour reached its climax. She was taken to a nearby maternity home where she delivered a baby girl christened Divine. 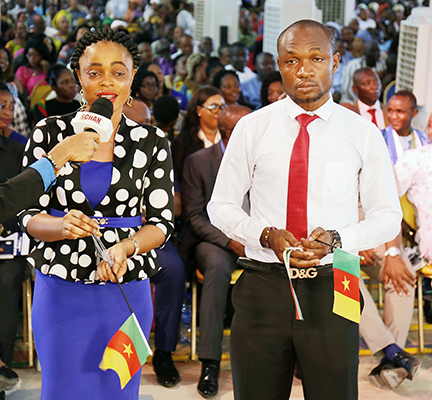 During their testimony, husband and wife expressed immense gratitude to God for turning their lives around. For physically disciplining her fighting children, Mrs Ani and her husband were denied access to them after the UK social services took them into protective custody in accordance with the Child Protection Law of the country. The matter was subsequently charged to court even as the case lingered for two years. It was an emotionally-turbulent time for the parents who were separated from their children. Mr Ani was not happy with the development and missed the affectionate moments he had spent with his four sons before the unfortunate incident set in. 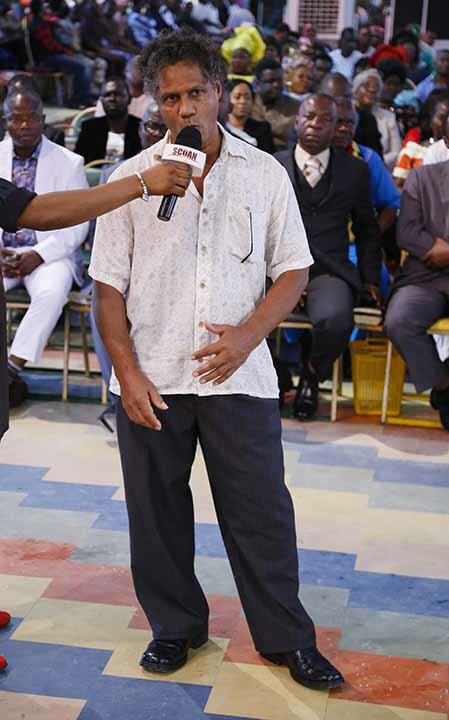 In his desperate search for help, he came down to The SCOAN all the way from the United Kingdom to see Prophet T.B. Joshua who prayed for him and gave him the Morning Water for his children. 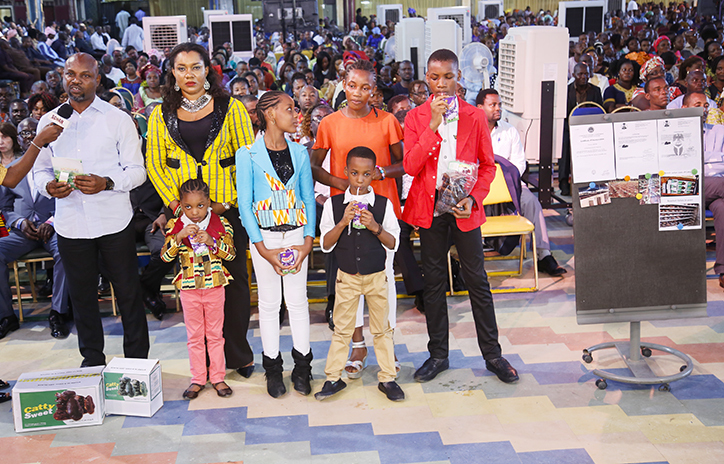 Sometime ago Mr and Mrs Livinus Ifeanyi had been to The SCOAN after the husband had received a prophecy from Prophet T.B. Joshua concerning their then crumbling marriage. The man of God had requested the presence of his wife who on her own had made it categorically clear that it was only Prophet T.B. Joshua that could settle whatever problems she had with her husband. 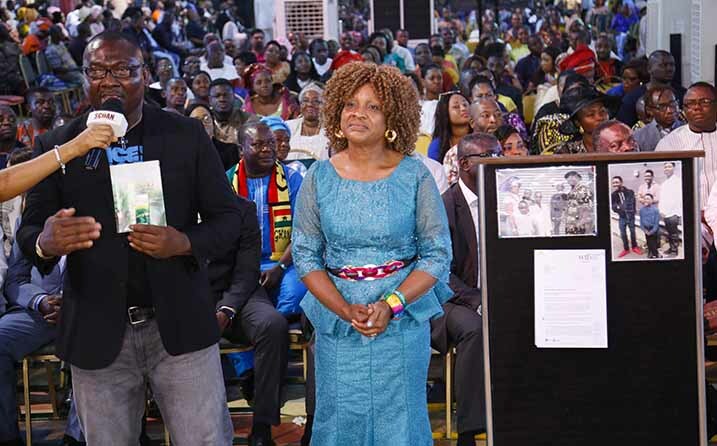 The man of God had counselled the couple under the direction and guidance of the Holy Spirit and had urged them to put their differences aside and embrace peace as husband and wife. The couple heeded the advice of the man of God and since then, the peace and new-found affection in their home has been marvellous. PLEASE ASSIST ME WITH AN EMAIL ADDRESS WHERE I CAN SEND MY PRAYER REQUEST. The only thing I can say is that blessed are those who are born again in Christ and always maintain their faith in the Heavenly Father through His Beloved Son Jesus Christ. Please pray for me so that i will be able to forgive any body who will offend me,also pray for me to get my promotion and financial breakthrough so that i will be able to pay my fees and build my own house . VIEWERS ALL OVER THE WORLD MESSAGE FROM PROPHET TB JOSHUA!!! You are to contact us here in our admin for verification department email:Scoan , If you would like to join EMMANUEL TV PARTNER contact the Below E-mail address And ORDER FOR THE NEW Morning anointed water,sticker,mirror book and your invitation letter to the Scoan, CONTACT SCOAN ADMIN EMAIL ADDRESS BELOW…. : Scoan Below Email Address For years:…. Fill in the followings and send to this official. Pray for me and my husband north to see results this year looking for that baby girl or twins. Thank you for your new posts.I have just received now. Thank you in advance, God bless you all. I received you blessed messages and am happy please man of God prophet TB Joshua pray for me.Leonard Munguya,am planing to visit you,am a Zambian citizen. Thank You Jesus Christ for The SCOAN. Emmanuel! We thank God of prophet TB JOSHUA for this couple, that the man of God prophecies that her wife Bites him.if this woman is testified about her marriage God almighty is great. I Never believe that this woman will come back to Testimony .according to her back videos we say when TB JOSHUA INVITED HER. IN short GOD is great. I was so successful and surprise to see there testimony. THIS message of Wise man DANIEL cover everything in this testimony . To the glory of God, Emmanuel!!! I need spiritual healing. Please pray for me. Please help me to get the invitation letter to Nigeria. “Forgiveness is so important because a relationship does not involve two perfect people. Perfect people do not exist on earth.” If we can understand this what man of God quotes in this sentence, we will be able to forgive others in all circumstance. Thank you man of God for this word of life. us every single munite that had strendthened our heart’s desire for CHRIST JESUS.Thanks you my father spiritual father senior prophet T.B JOSHUA. Indeed as you have said,it is well with my soul as i type this texts.My heart have been uplifted in CHRIST JESUS FOREVERMORE.AMEN. VIEWERS ALL OVER THE WORLD! Please beloved,we need ur prayer’s and help us in any way u all can. of the two couples,will make mine too to be restore in JESUS’ Name Amen. GOD,Amen.By His words we are heal and covered by HIS precious blood. i feel very peaceful and free for indeed our God reigns and his faithfulness reaching the sky and his love enduring all things here on earth we are blessed by God’s servants. John 15:7-8 7 If you abide in Me and My words abide in you, you will ask what you desires and it shall be done for you. 8 By this My Father is glorified, that you bear much fruit, so you will be My disciples. The Holy Bible is advising us that the beautiful Lord Jesus Christ said that: If you remain in me and my Living Words remain in you, then you will ask for anything you wish and you shall have it. Our Lord and Savior is the true vine and our Heavenly Father is the vine grower or the gardener. He prunes the branch that does bear fruit so that it will be more fruitful. Let us remain in Him. Because no branch can bear good fruit by itself. It must remain in the vine. Neither can we bear good fruit unless we remain in Him. The beautiful Lord Jesus Christ is the is the vine and you are branches. If you remain in Him and I in Him. You will bear much fruit. In the Book of Ephesians 3:12,14-17 12 In whom we have boldness and access with confidence through faith in Him. 14 For this reason I bow my knees to the Father of our Lord Jesus Christ. 15 From whom the whole family in heaven and earth is named. 16 That He would grant you according to the riches of His glory, to be strengthened with might through His Spirit in the inner man. 17 That Christ may dwell in your hearts through faith that you being rooted and grounded in love. We are advised that the anointed servant of The Most High God was saying that: In Him and through faith in Him we may approach the awesome God Almighty with freedom and confidence. For this reason I kneel before the Father from whom his whole family in heaven and on earth derives its name. I pray that out of His glorious riches He may strengthen you with power through His Spirit in your inner being. So that Christ may dwell in your hearts through faith. And I pray that you being rooted and established in love. We are advised to love one another and to pray for one another, so that we may be sons and daughters of God. He causes His sun to rise on all His people, and sends rain to all His people He created. The gracious God Almighty will strengthen you with all power according to His glorious might and riches. He will strengthen you, help you and uphold you with His righteous right hand. He will give you more than you need so that you will always have all you need for yourselves and more than enough for every good cause. He will do exceedingly abundantly give you more than you ask or imagine according to His power that is at work within you. For we are the temple of the Living God. As the awesome God Almighty has said. I will live with you and I will be their God and they will be my people. In the Book 1 Corinthians 10:31-33 31 Therefore whether you eat or drink, or whatever you do, do all to the glory of God. 32 Give no offense either to the Jews of to the Greeks or to the church of God. 33 Just as I also please all men in all things, not seeking my own profit but the profit of many, that they may be saved. We are advised that Apostle Paul sent an Epistle to the First Corinthians telling them that: So whether you eat or drink or whatever you do, do everything for the glory of God Almighty. Give no offense to the people of God or to the church of God. Just as I try to please everyone in everything I do not seeking my own advantage but that of many, so that they may be saved. I have forgiven others, because the beautiful Heavenly Father will also forgive me In the Book of Mathew 6:9-14 9 In this manner therefore pray. Our Father in heaven. Hallowed be Your name. 10 Your kingdom come. Your will be done on earth as it is in heaven. 11 Give us this day our daily bread. 12 And forgive us our debts. As we forgive our debtors. 11 And do not lead us into temptation. But deliver us from the evil one. For Yours is the kingdom and the power and the glory forever. Amen. 14 For if you forgive men their trespasses your Heavenly Father will also forgive you. I ought to be kind to others, tenderhearted, live in harmony with others and forgive others, because awesome God Almighty and Christ Jesus forgave me. You can do everything through Christ who strengthens you. He will give you the desires of your heart and make all your plans succeed according to His will. He will give you success in everything you do according to His will. He will satisfy your desires with good things. He will bless you and make you fruitful and increase your numbers. He will bless all the work of your hands and He will bless everything you put your hands to. In the Book of Deuteronomy 10:20-21 20 You shall fear the Lord your God you shall serve Him and to Him you shall hold fast and take oaths in His name. 21 He is your praise and He is your God who has done for you these great and awesome things which your eyes have seen. We are advised that: We ought to fear and to love the Lord our God and serve Him. Hold fast to Him alone and take your oaths in His beautiful name. He is our praise, He is our awesome God, who performed for you those great and awesome wonders you saw with you own eyes. We ought to live in harmony with one another. In the Book of 1 Peter 3:8 Finally, all of you be of one mind, having compassion, for one another, love as brothers, be tenderhearted, be courteous. We are advised to have unity in the spirit, sympathy love for one another, a tender heart and a humble mind. The gracious God Almighty will richly bless you and your family with all of Gods blessings. He will give you and your family a happy and good health long life. He will lavish you and your family with His love and He will fill your house with His glory. Since you are children of The Most High God then you heirs – heirs of God and co-heirs with Christ Jesus, because you share in His glory. May the incomparable riches of God’s grace and the fellowship of the Holy Spirit and the love of Christ be with you and your family now and forever. In the name of Jesus Christ. You are to contact us here in our admin for verification department email:Scoan, If you would like to join EMMANUEL TV PARTNER contact the Below E-mail address And ORDER FOR THE NEW Morning anointed water,sticker,mirror book and your invitation letter to the Scoan, CONTACT SCOAN ADMIN EMAIL ADDRESS BELOW. : Scoan Below Email Address For years:…. Thank you Jesus my redeemer, saviour, healer deliverer and shield.